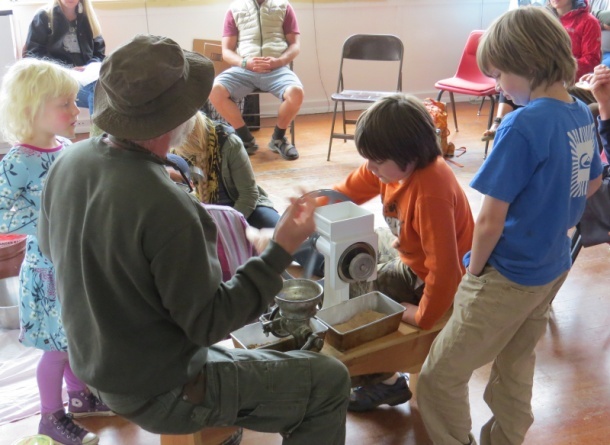 A free Sustainable Living Skills Fair at the new Jefferson Community Center in Eureka on Saturday, April 19 drew about 350 people of all ages for a day of fun, learning, food, and community building. More than 25 workshops were offered throughout the day by resident experts on topics such as home gardening, food preservation, disaster preparedness, mushroom cultivation, reducing energy usage, food as medicine, soil biology, rainwater catchment, and compost. Community groups and local businesses offered free resources, services, and demonstrations all day including a home weatherization program, seed planting, stone oven building, solar energy, and smoothies made with a bike-powered blender. The Community Bicycle Kitchen and Indoor Imagination Playground, both current programs at Jefferson, were open during the event. Fruit- and vegetable-infused water and coffee were available throughout the day, and bagels were offered in the morning from Los Bagels. 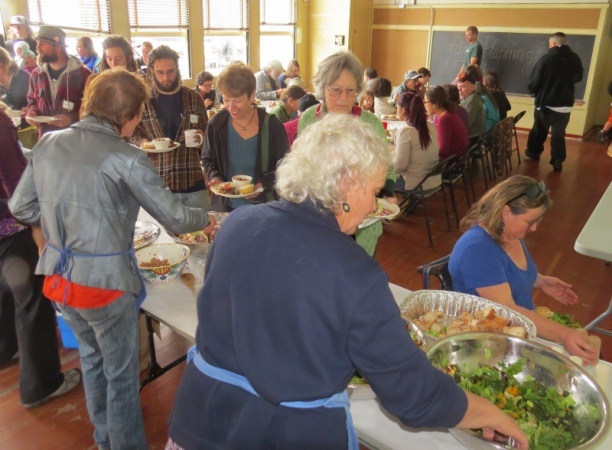 A delicious home-cooked vegetarian lunch featuring ingredients from local gardens and farms was served to all, prepared by the Jefferson Community Center. The day was filled with laughter, conversation, smiles, good food, networking, and exceptional educational opportunities. Event organizers, including representatives of Redwood Community Action Agency, Transition Humboldt, the Humboldt Permaculture Guild, North Coast Community Garden Collaborative and Plan It Green, would like to thank the many supporters of this spectacular event, including volunteers, presenters, community groups, and our generous sponsors. Sponsors include Humboldt County Department of Health and Human Services CalFresh Outreach Partnership, Flying Blue Dog Farm and Nursery in Willow Creek, Pierson Building Center, Eureka Natural Foods, North Coast Co-op, Locally Delicious Inc., High Tide Permaculture, Miller Farms, Wildberries Marketplace, Redwood Alliance, Eureka Vacation Rentals, Revolution Bicycles, Water Planet Garden Supply, Wildcat Solar, Freshroots Humboldt, Mad River Gardens, Coast Central Credit Union, Bien Padre, Los Bagels, and Brio Breadworks. 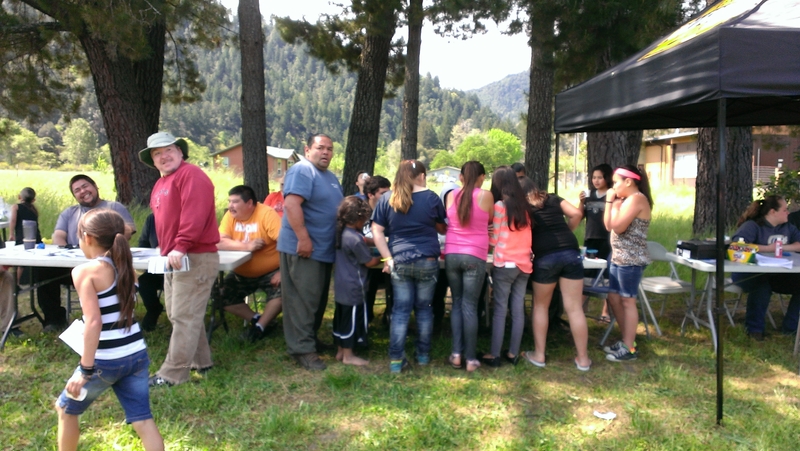 Many families and children came out to celebrate Earth Day at the garden on Friday April 18. 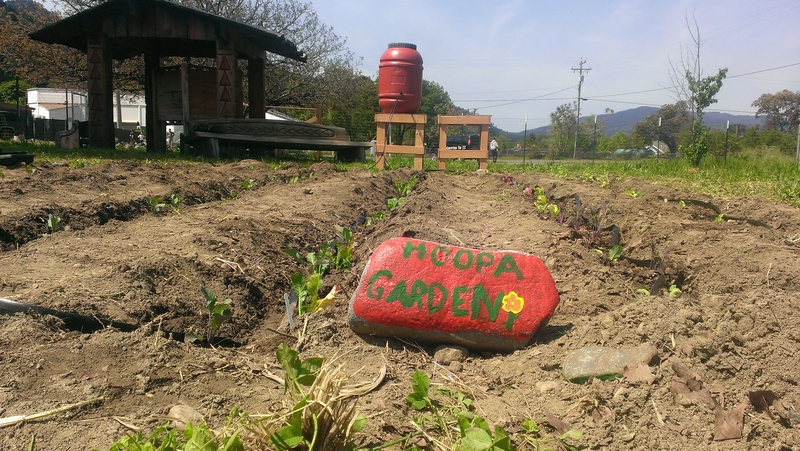 Hoopa Elder William "Bill" Carpenter gave a blessing of the garden. Freshly prepared salmon and vegetables were served. A dripline irrigation system was installed in a new garden area, which was planted by children with broccoli, cauliflower, cabbage, kale, and lettuce. Perennial edible plants were planted as part of North Coast Community Garden Collaborative's Food Grows Community project which the garden was selected to receive last fall, including a retrofit of their beautiful hand carved redwood kiosk (to add plexiglass and cork/white boards) and plantings of edible perennial plants. Blueberries, artichokes, strawberries, oregano, thyme, and lemonbalm were all planted on the 18th with help of the Tribal California Conservation Corps. Children also enjoyed dying eggs, painting rocks, and making smoothies on the bike blender brought by the Department of Health and Human Services' Healthy Families Division. The event was a great community celebration of our precious Earth upon which all Life depends. This month's Community Gardener "Meet and Greet" is on Wednesday May 21 from 5:30 - 6:30 pm at Hammond Park Garden in Eureka. Come network with local gardeners, talk with local experts, enjoy yummy food, and get free gardening resources. Come early for North Coast Community Garden Collaborative's monthly meeting from 4:30 - 5:30 pm- anyone is welcome and we welcome your ideas! The Garden is located on 14th between E and F Streets, near playground and tennis courts. Please email Debbiep@nrsrcaa.org or call (707) 269-2071 with questions or for more information, and hope to see you there! - Free Produce Market, Fortuna: Wednesday May 21 from 11:30am - 1:30pm at 2331 Rohnerville Road. Call Food for People with questions at (707) 445-3166. - March Against Monsanto: Saturday May 24 starting at 2:45pm at Second and I Streets. For more information please call (707) 444-8044. - Garden Tour at Trinidad Home: Sunday May 25 from 10am to 3pm at 1726 Stagecoach Road. $10/person, $20/family. - UCCE Cottage Food Operation Two-Part Workshop: Wednesdays May 28 and June 11 from 9 am to 4:30pm at Agriculture Center on Humboldt Hill Road. To register or for more information please visit http://ucanr.edu/cfoworkshops, call (530) 752-0467, or email shermain@primal.ucdavis.edu. - Free Produce Market, Southern Humboldt: Tuesday June 10 from 10:30am - 12pm in Garberville at the Presbtyrian Church (437 Maple Lane) and 12:30 - 1:30pm in Redway at the Baptist Church (553 Redway Drive). There are still plots open for gardeners at this community garden, located behind the preschool on Gwin Road and next to the bocce ball court. Plots are 3' x 10' and gardeners also have access to a communally maintained garden space. For more information or to rent a plot please call the Parks and Recreation office at (707) 839-9003. The garden is in need of someone to help mow the fruit tree orchard this summer while the on-going volunteer recovers from surgery. The orchard provides fresh fruit to the community and is distributed at the food pantry. There is also room for more gardeners at the garden. If you're able to help or want more information on either the orchard or garden please contact the Rio Dell Family Resource Center at (707) 764-5239. Gardening Gazette is a free publication of North Coast Community Garden Collaborative, a support network of and for community gardeners working together to increase access to fresh, healthy, and culturally appropriate foods for all North Coast residents. Our aim is to connect gardeners to resources in the community including garden classes, workshops, materials - as well as to other gardeners so they may share seeds, starts, tools, and knowledge. We are overseen by a volunteer Steering Committee with representatives from Redwood Community Action Agency, Food for People, University of California Cooperative Extension, and Open Door Community Health Centers. To learn more please visit www.northcoastgardens.org, email DebbieP@nrsrcaa.org, or call (707) 269-2071.